That Tweet--sent out by a reporter during the men's alpine skiing "Super G" final early this morning Central time--is perfectly representative of the tension in which we Olympics zealots exist during this transitional period for communications media. There are so many different ways to follow the events of the Sochi Games. I can choose on which events I want to focus my attention, and I can even choose from among different perspectives on which I want to view them (i.e., I wonder what it's like to follow the Olympics as a Latvian). And then there are all the choices around timing. I can wait to consume what Bob Costas/Matt Lauer/Meredith Vierra want to serve me in the prime-time NBC newsreel. Or, I can get dispatches on the proceedings as they are updated and delivered to me over the course the day through various news outlets. Or, I can follow events as they happen through results recording at sites such as Sochi2014.com, live video streams at NBCOlympics.com or crowd-sourced, near-real-time documentation through social media. But the pursuit of the most meaningful Olympics experience possible can be pretty worrisome and unsatisfying. It's easy for the whole endeavor to turn into another thing on which one feels behind (oh, yeah, I also need to get together my taxes, too). And stuff like unintended glitches with synchronicity--such as the one illustrated by the Tweet above, where someone's video-stream drama is spoiled by a stray social-media remark because of issues around packet latency--can be a real bummer. I am a staunch believer that The Internet Is Amazing™. But I believe that it's pretty easy to flood the fun out of stuff now with choice anxiety and IT frustrations. Yesterday, I was at Rough River State Resort Park in Falls of Rough, Ky., during the Team USA-Russia men's hockey game that the United States ended up winning in a shootout, 3-2. It was a great place to be. 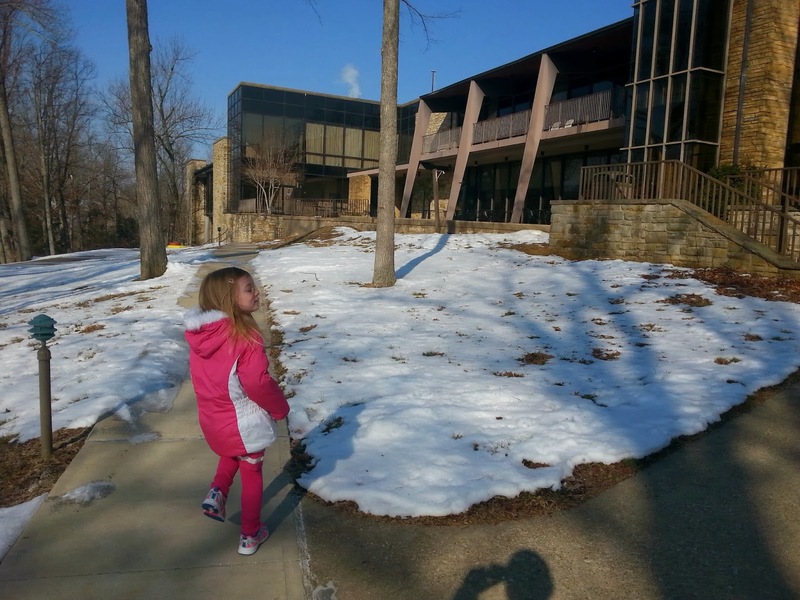 Amid the snow and mid-century-modern, institutional architecture, I imagined our being at an Olympic athletes village. But there were some problems, too. The lodge's cable package does not include NBC Sports Network, so I ended up instead putting MSNBC on the TV to watch the Switzerland-Russia women's hockey game and tuning in the live stream of the men's game on my laptop. I was able to keep abreast of what was going on, for the most part. But buffering issues kept plaguing the video over the guest Wi-Fi, so it kept falling farther and farther behind the more and more enthusiastic Twitter traffic I was also following from Sochi. 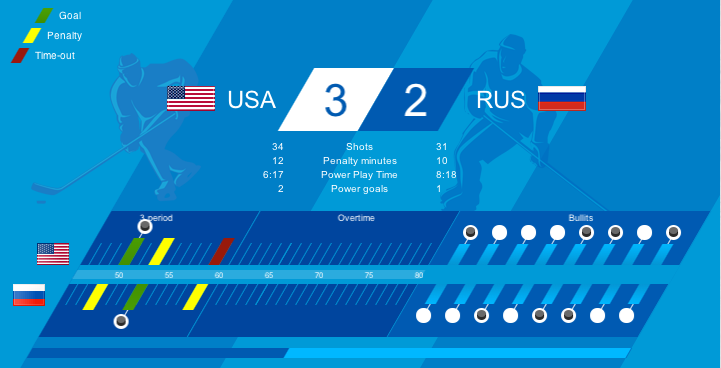 By the time the hockey game boiled down to the shootout, I was so agitated and on edge that I limited myself to simply watching for the appearance of empty white or blacked-in dots at Sochi2014.com's page for the game. Then, when T.J. Oshie, a 27-year-old from Warroad, Minn., accounted for his fourth blacked-in dot in six shootout tries and I realized that it had actually given Team USA the win, I erupted. And when I erupted, I erupted right along with a lot of the rest of the country and even the world. And that's a very, very neat feeling. But you know what was an amazing feeling? I know it's not at all an apples-to-apples comparison. I was 11. Rooting for the American college students against the USSR in 1980 was different than rooting for the NHL stars on Team USA against the NHL stars on the Russian Federation team in 2014. Also, that 1980 win clinched the U.S. hockey team a medal; this squad hasn't won anything yet. Still, there are some aspects of watching stuff like the Olympics on TV in the big-three-networks era that I need to adapt for today--something about setting myself up to just receive the good as opposed to concentrating on capturing the best. I didn't get to pay much attention to the Olympics today; I know how that Super-G skiing final came out, but, otherwise, I'm just watching the prime-time show on NBC tonight and seeing what happens. To me, of all the snowboard sports, this is the one that looks great but also seems to have an credible, objective and non-random competition. Gold in women's snowboard cross goes to a 20-year-old from the Czech Republic in her first Olympics, Eva Samkova. Silver goes to Canada; bronze, France. Team USA's leading medal hope was considered to be Lindsey Jacobellis, a 28-year-old from Stratton, Vt., who won silver in the event at Torino 2006. But she crashed in a semifinal--just as she did in 2006 and at Vancouver 2010. Faye Gulini, a 21-year-old from Salt Lake City, rallied from sixth place about two-thirds through the final run to finish fourth. After a week of watching luge and skeleton competitions, it seems like the bobsleighs are lumbering along at about 20 miles per hour. The two-man bobsled is two heats, and the United States 1 team stands third behind Russia and Switzerland. The United States 3 team is in 13th. The brakeperson for this team, Dallas Robinson, is an Oldham County High School and Eastern Kentucky University graduate who previously played for the U.S. rugby team and who Tweeted out a bunch of C.S. Lewis quotes in the last several days. Well, I'm very happy for Bode Miller, claiming a bronze medal in the men's Super G event and becoming the first U.S. alpine skier to amass six career Olympic medals. It has been an eventful and lengthy Olympic run for the 36-year-old from Easton, N.H. The silver in the event went to Andrew Weibrecht, a 28-year-old from Lake Placid, N.Y., who won bronze in the same event at Vancouver 2010 and then placed 168th, 83rd and 101st in the three World Cup seasons since. The gold went to Norway (again) and a Czech competing for Canadian tied Miller for bronze. Back to men's hockey, the United States won the last of its group games, 5-1 over Slovenia today. Russia ended up having to play another shootout, and this time it won, 1-0, over Slovakia. Before today's games, it was projected that the United States and Russia might've played a rematch in the second round of the medals tournament. But now the two teams are seeded on opposite sides of the bracket and would not face each other until the gold- or bronze-medal game. Team USA gets a bye through Tuesday's first round (or "qualification playoffs"). In the quarterfinals Wednesday, the Americans will get either seventh-seeded Czech Republic or 10th-seeded Slovakia. The women's hockey tournament is already to the semifinals. Team USA plays Sweden, and Canada plays Switzerland tomorrow. The gold- and bronze-medal games are both scheduled for Thursday. Both the U.S. men's and women's curling teams have been eliminated from medal contention. Round-robin games continue, but, in both the men's and women's competitions, Canada and Sweden have qualified for the four-team medal tournaments. In other medal competition Sunday, the Dutch swept first, second and third (and fourth) in the women's 1,500-meter speed skating, and the men's 4x10km cross country relay medals went to Sweden, Russia and France. The "BMW IBU World Cup Biathlon 5" is starting now, and Eurovision is streaming it live. The Internet Is Amazing. The XXIII Winter Olympic Games, Pyeongchang 2018, starts about 1,118 days from today. I thought this was a great piece. For me, the age of the Internet means that I have a really strong reaction against anything that's delayed or packaged, and so my consumption of the Olympics has declined as a result. (The last Winter Olympics that I remember watching a lot of was in 1994; since then I have mostly stuck with college basketball.) But I agree with you that it is not an easy problem to solve.